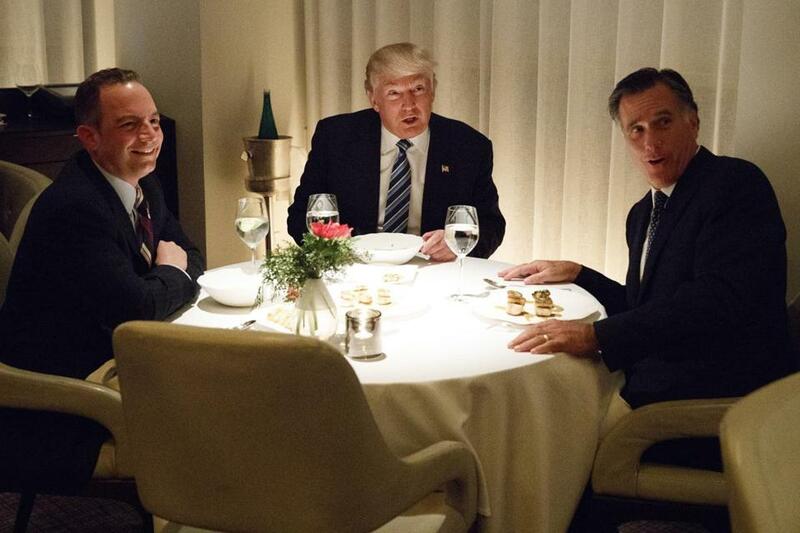 President-elect Donald Trump ate dinner with Mitt Romney (right) and Reince Priebus (left) at the Jean-Georges restaurant on Tuesday. They talked for more than two hours, they laughed, they munched on carefully prepared frog legs, and afterward, Mitt Romney, once one of Donald Trump’s harshest critics, emerged a changed man. ‘‘What I've seen through these discussions I've had with President-elect Trump, as well as what we've seen in his speech the night of his victory, as well as the people he’s selected as part of his transition, all of those things combined give me increasing hope that President-elect Trump is the very man who can lead us to that better future,’’ he added. It was almost as if Romney had not been one of Trump’s leading detractors, calling him a ‘‘con man,’’ a ‘‘fake’’ and a ‘‘phony’’ who was unprepared for the presidency. ‘‘His domestic policies would lead to recession,’’ Romney had declared in a speech eviscerating Trump in March. ‘‘His foreign policies would make America and the world less safe. 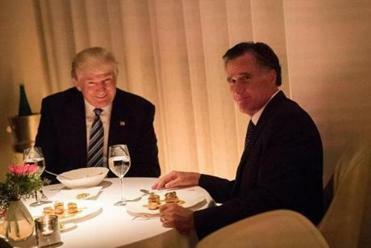 The dinner between the political bigwigs prompted many to react online, particularly to Mitt Romney’s seemingly uncomfortable expression. ‘‘He has neither the temperament nor the judgment to be president and his personal qualities would mean that America would cease to be a shining city on a hill,’’ he added. But now, with Trump assembling his Cabinet, Romney has improbably found himself on a short list of candidates to serve as secretary of state. The second meeting of the two men, this time in the dimly lit dining room of Jean-Georges restaurant inside of Trump International Hotel & Tower New York, was the most public show of rapprochement yet. As they entered the room, patrons applauded. Minutes into the meal, as Trump and Romney (both abstainers) sipped on their wine glasses of water, members of the traveling press pool were allowed in the room for a photo-op. Concern from some within Trump’s circle that Romney lacked the requisite loyalty to be considered for the critical position of chief diplomat has spilled out into the open for days. Emerging from the dinner, the 2012 Republican presidential nominee seemed to address those concerns, noting pointedly that Trump had done something he had been unable to do: win. Trump seemed please. Upon leaving the dinner, he was asked by CNN’s Jim Acosta whether Romney might be his next secretary of state.